This day didn't start too fabulously. I spent half of it collapsed on the couch. I wish I could say I was reading or knitting or doing something equally exciting, but I was mainly spending the time trying to not have a pounding headache and getting rid of the general ickiness I was feeling. At first I was really confused why I was feeling this way, and then it dawned on me. For the past couple of days I didn't take my Claritin. I probably should be taking my allergy medication during the Spring when flowers are starting to bloom again. ::sigh:: I wish I could give a good excuse for not taking it but it was out of sheer laziness. 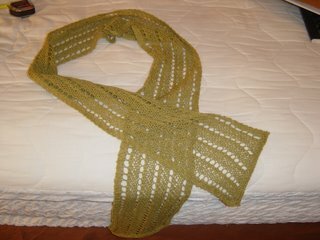 After deciding that the couch didn't have any remedies for my allergies, I decided to block my FINISHED green slanty lacey scarf. When I was putting the pins in the scarf, I was, to be perfectly honest, bored. I kept thinking to myself: "Why do people knit things that require blocking? 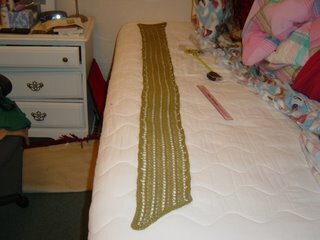 This is really boring and I am just blocking a scarf! 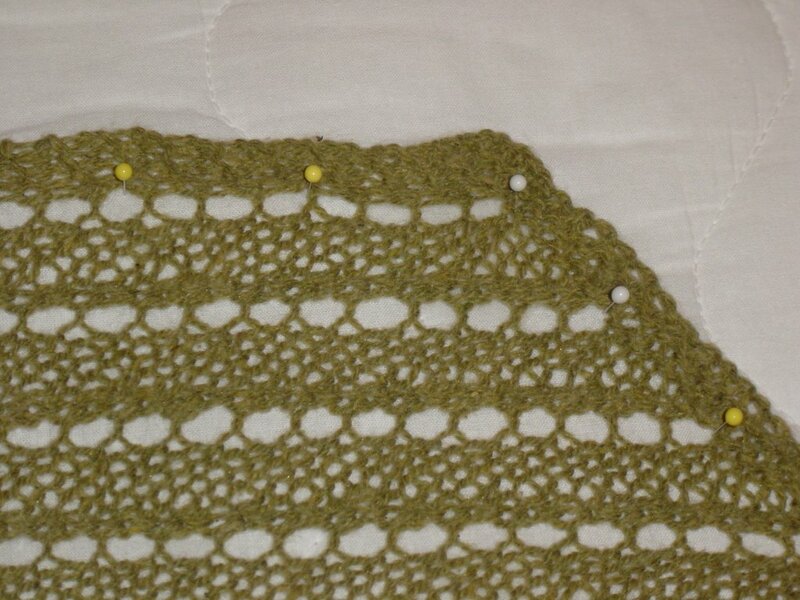 It must take forever to block a shawl. I never want to make a shawl if this means that I will have to block something larger and take significantly more time to put all the pins in the knitting object." After the scarf dried and I took the pins out though, oh my goodness. My opinion completely changed. The scarf was drapey! It wasn't heavy anymore. I didn't fold upon itself and just look bloby. It was beautiful. 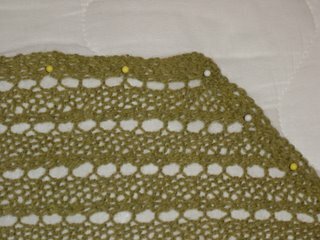 I can't wait to make shawl now! I have to make two more completely random comments. First, I watched Harry Potter and the Goblet of Fire last night. If you own the 2 disc version, you need to watch the deleted scenes. In the last deleted scene (but I am not sure), there are amazing shots of the Harry Potter scarf. Honestly, all I could think of during the scene was "hmm, that is an interesting scarf but I like the original better." I am sure that the characters spoke during the scene but the scarf was really the major character in the scene. My second comment is that last night I bought yarn ONLINE! I decided that I want to make that bloody alien scarf and I am tired of searching for it in yarn stores. I am pretty excited about this. Hopefully, I will time just right and finish another project before the yarn comes (or in the very least, before I start another project). Blocking truely is so transformative. Love it. Gorgeous scarf.